Donald Trump has set out to disrupt America’s traditional relationships, prioritizing trade over stability and security. Do you think the United States and China are heading for a damaging trade war? I don’t think that the deterioration in trading relations between the US and China is likely to stop any time soon. 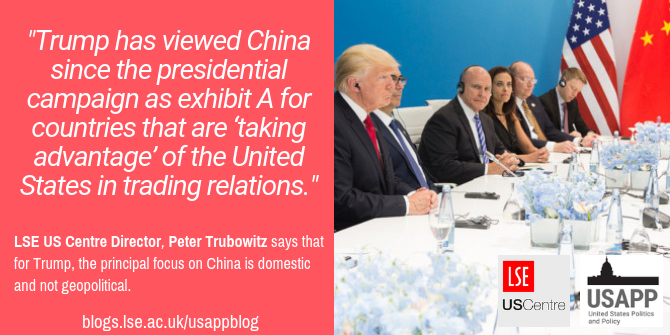 Trump has viewed China since the presidential campaign as exhibit A for countries that are ‘taking advantage’ of the United States in trading relations. His actions make it very difficult for Xi Jinping to back down and it’s going to get worse before it gets better. The fact that we are headed into the midterm elections in November is likely to exacerbate things – partly because Trump needs issues to nationalize the midterms, and I think that China is one. The calculation on Beijing’s side is that they should wait for the outcome of the midterms, expecting that Trump and the Republicans will lose altitude and that Trump will be in a weaker bargaining position. That may be the wrong calculation, but I think that’s what Beijing is thinking. Should we see this as less about trade balances and more about strategic competition between the United States and China? Certainly the Trump administration is the first in the post-Cold War era to define China as a revisionist power, one that is bent on changing the international order. But it is also very hard to view what Trump is doing outside the context of his almost single-minded focus on the trade balance. For many Americans China symbolizes the loss of America’s edge and the loss of jobs – and for good reason, because many jobs have gone to China over the course of the past 15 years, ever since China has been in the World Trade Organization. So for Trump, the principal focus on China is domestic and not geopolitical. I say that because, were it geopolitical, he wouldn’t have taken a piece off the chessboard like the Trans-Pacific Partnership trade agreement (linking the US to 12 Pacific-rim countries but excluding China). Trump took it off immediately when he came in and so I think that this is driven more by a domestic political calculation. It is worth bearing in mind that the president’s National Security Strategy takes a broader view of China’s ambitions and trajectory. How have views in Washington changed about China? There are now fewer people who are convinced that China can be engaged and turned into a status quo power. There were already signs of that shift before Trump arrived in Washington. That said, many in the Washington foreign policy establishment have misgivings about Trump’s approach towards China over trade. For now though, Trump has his way on trade with the Republican-controlled Congress. That could change if the Republicans get hammered at the midterm elections. Trump is turning America’s alliances into transactional relationships, particularly regarding Europe and Germany. Isn’t this a necessary development, given the end of the Cold War and America’s relative decline in the world? What you are really asking is whether Trump’s actions are symptomatic of deeper structural changes in America’s place in the world. There is something to this. For most of the Cold War, Americans focused on what its many alliances had to offer, rather than what they cost. In part, this was because of widespread anxiety about Soviet power and ambitions. What is often forgotten is that Americans were willing to tolerate those costs because they could afford to do so. The Cold War was an era of unprecedented shared prosperity in the US, when Americans up and down the economic ladder gained from economic openness, from interdependence – from, broadly speaking, globalization. Inclusive growth made it easier for middle-class Americans to support the vast network of military alliances, overseas bases and security commitments. Neither of those conditions hold today. While China bears watching, no clear competitor has emerged to take the place of the Soviet empire. Also, the economic pillar has weakened. At least since the 2008 financial crash, Americans have become more sensitive to the cost of international leadership. None of this was lost on Trump. He has sought to exploit this shift in sentiment, largely for domestic political reasons. I don’t think it was lost on Barack Obama, either. In a different way, he also tried to bring America’s commitments back into line with what Americans are now willing to accept. “President Trump’s Trip to Germany and the G20 Summit” by The White House is Public Domain. Relations between Russia and China seem to be getting closer every day and we have even seen Chinese troops invited for the first time to take part in Russian military exercises. Does the US have any levers to disrupt this process? Xi Jinping and Vladimir Putin clearly have reasons to coordinate their respective Eurasian initiatives: China’s Belt and Road Initiative and Russia’s Eurasian Economic Union. But there are reasons not to exaggerate the longer-range possibilities for alliance here. China’s economy is about eight times larger than Russia’s. That puts Moscow at a decided disadvantage. Meanwhile, Putin’s so-called ‘Going East’ strategy says more about Russian weakness than strength. There is little question that Putin’s gambit was driven partly by the need to find capital and markets following of US-led sanctions over its invasion of Ukraine, and also falling oil prices. Putin had nowhere else to turn. Xi is happy to have Moscow working with Beijing rather than against it, but it’s worth remembering that China and Russia are not exactly natural allies. None of this means that Washington should ignore opportunities to complicate Beijing’s and Moscow’s strategic calculations. One approach, as you seem to suggest, is the strategy that Richard Nixon and Henry Kissinger adopted in the 1970s, which was to have better relations with Beijing and Moscow than they had between themselves. But that kind of triangular diplomacy is not on the cards right now, at least not while Trump is in the White House. To stay with Nixon, the Trump administration seems to be in chaos. It’s often compared with the latter days of the Nixon presidency. Do you see any similarities? I think there are many parallels between the Nixon and Trump presidencies. A thin-skinned president who feels besieged and tormented by the press, an administration that is fraught with palace intrigue and backstabbing – as is evident in the new Woodward book, Fear: Trump in the White House – and unelected officials who are taking it upon themselves to protect the Republic, as they put it, from the president. There were similar things that went on during the Nixon administration. At the tail end of the Nixon years there was a great deal of concern inside the administration about the possibility that Nixon would try to create a foreign distraction. I think there are similar concerns in this administration. Whether this all ends with the president forced to resign in disgrace is hard to say. My guess is that we are in for a lot more disarray before this is over, especially if the Democrats take Congress in November. That’s not going to necessarily lead to impeachment proceedings, but it will almost certainly mean a steady stream of congressional investigations into the Trump administration’s policies and actions, which will only fuel Trump’s fears, the palace intrigue, the concerns about the president’s judgment. What are the chances of the Democrats taking the House in November? I think the chances are pretty good. Normally, the president’s party loses seats during a midterm election, so it will not be a surprise if the Democrats pick up seats. I think the only question is how many, and whether it is enough to force the Trump administration to play defence 24/7 for the next two years. If the Democrats take the House, and take it handily, that’s going to be the outcome. Among other things, I think this is going to mean, if this happens, that Trump will invest a lot more of his time in foreign policy, where he has more latitude to try to set the national agenda, keep his opponents off balance and distract the public from problems at home. So a stalemate at home but possibly trouble appearing on the international stage? Let me put it this way: if your readers don’t already have their seatbelts on, I would suggest they buckle up. This interview first appeared at Chatham House’s The World Today. Note: This article gives the views of the interviewee, and not the position of USAPP– American Politics and Policy, nor of the London School of Economics. Peter Trubowitz is Professor and Head of International Relations, and Director of the LSE’s US Centre. His main research interests are in the fields of international security and comparative foreign policy, with special focus on American grand strategy and foreign policy. He also writes and comments frequently on US party politics and elections and how they shape and are shaped by America’s changing place in the world.